Explore what National Geographic says is one of the top cities in the world to visit! Let us take you on the only San Francisco Food Tour where you’ll explore the food, history, art and culture of the great – and surprising – city of Oakland. For guests joining us for the San Francisco food tour portion, your guide will meet you at San Francisco’s Ferry Building where you’ll start your tour with a flavorful and filling taste of an award-winning Oakland original. 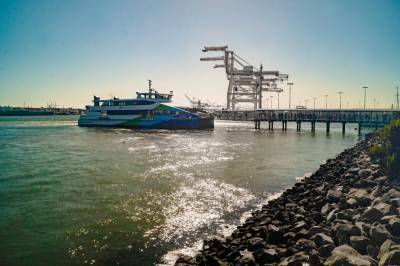 You’ll then continue across the Bay on board the San Francisco Bay Ferry, enjoying breathtaking views of Alcatraz Island, the San Francisco Bay, Ferry Building Marketplace and Bay Bridge. 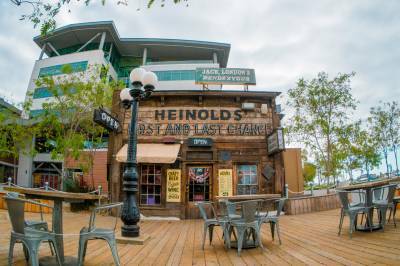 Once in Oakland, you’ll walk along the East Bay’s waterfront and say “cheers!” to the heritage of Jack London Square, the historic warehouse district and the newly founded Jack London Brewing District. We’ll take you to four stops where you’ll satisfy your tastebuds and enlighten your cultural soul. You’ll not only be immersed with the local food and spirits scene, but also the community of artists that make up the unique flavor of Oakland. They don’t call us the “Brooklyn of the West” for nothing! Whether you arrive by ferry, Amtrak, BART or car, we’ll guarantee you’ll love Oakland as much as we do and will want to stay and explore The Town. To be honest, no Bay Area excursion is complete without experiencing Oakland and the East Bay.